Flight. Sept 13, 2002 Howard Hughes was the builder of the original Hughes H-1B (serial #1), which now sits in the Smithsonian Institute in Washington DC. Back in 1935 he flew that aircraft to a new land speed record and for a brief period of time was the fastest person ever to pilot a land airplane. He was a man with remarkable ambition who built his dreams for himself instead of waiting for the world to create them for him. He was also a secretive man. His life and his accomplishments are somewhat of a mystery, and the H-1 is no exception. The history books only touch briefly on the H-1, an airplane that Hughes reportedly considered one of his greatest achievements. Unraveling the history of the H-1 and of Hughes during that era was an intriguing challenge. The impact that the original aircraft had on aviation made it a natural choice for a team that wanted to build a one of a kind reproduction. Barely forty hours were flown on the original. 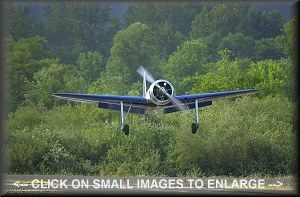 Yet, according to the Smithsonian Institute, "The Hughes H-1 racer was a major milestone aircraft on the road to such radial engine-powered World War II fighters as the American Grumman F6F Hellcat and Republic P-47 Thunderbolt, the Japanese Mitsubishi Type 0 (Zero), and the German Focke-WuIf FW 190." The H-1 broke the world speed record at 352 mile per hour, could fly from standard runways, had practical flight characteristics, and had an almost unimaginable range of nearly 4000 miles! Hughes flew the H-1 from Los Angeles California to Newark New Jersey in 7 hours 23 minutes without stopping for fuel. That was fast enough to capture the world record, and that was in 1937! 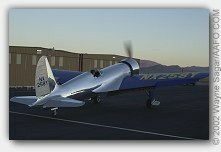 Since the goal of the Racer Team was to recreate the aircraft as precisely as possible, the Team needed access to the original. Using Paul Matt drawings of The Racer, estimates were made regarding fuselage and wing shape. Then reverse templates were cut using these estimates. The Smithsonian graciously allowed members of The Team access to the H-1 outside of normal business hours to make measurements. The reverse templates were held up to the actual H-1, and notes were made where they did not match. Several trips to Washington D.C. were required during the design phase. 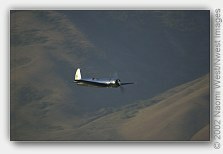 With each trip, the Racer Team gained new appreciation for the genius of Howard Hughes. Whatever else Hughes may have been, his genius in aircraft design was becoming apparent. Hundreds of pictures were taken, and pages upon pages of notes were made. While this work was being done, hundreds of man-hours were spent in research. It seemed like everyone that had any knowledge of the original H-1 was eager to help. We were impressed with companies such as Pratt & Whitney, Stoddard Hamilton, and others who happily opened their historical archives to help us understand Hughes and the H-1 better. We learned from the historian at Pratt & Whitney, Jack Connors, the history of the R-1535 that we have, as well as the history of the original that sits on the H-1 in the Smithsonian. They actually have documented history on each and every engine that they have built. It turns out that Pratt & Whitney had leased the engine to Hughes for the record-breaking attempt. Mr. Connors noted (with a chuckle) that there was no record that Hughes ever actually paid Pratt & Whitney for the engine! Of The Hughes Racer We learned from an original test engineer on the R-1535, Skip Eveleth, that in his opinion the engine was one of the most trouble free twin row engines built. 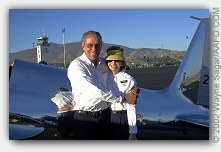 Skip worked directly with Howard Hughes on the project. Skip was a test engineer on the R-1535 in the 1930's and assisted in tracking down the original performance figures for the R-1535 for our Racer Team. There were less than 3000 of the R-1535 engines made, and today they are exceedingly rare. Most are believed to have been destroyed. 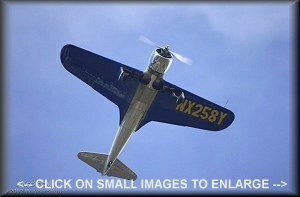 We believe that the engine installed on the Racer replica is the only known flying example of a P&W R-1535 in the world. Howard was anxious to work with Skip to obtain performance figures on the engine. At the time these were considered classified. Apparently Pratt & Whitney wanted Hughes to have the data, despite the classification. According to Skip, Howard was directed to an office that by "sheer coincidence" had the performance figures laid open upon the desk. Howard was instructed to wait in the room while they reviewed his request for the data. Skip's boss returned a short time later to inform Hughes that his request for the information was denied. With a grin Hughes replied that he would no longer need it. Skip also recalled, (with a chuckle) that when Howard Hughes called him to discuss the data, that he called him collect. Skip asked his boss if he could accept collect calls to which his boss replied, "Only from Howard Hughes." We had many discussions with one of the original design engineers on the H-1, Mr. John Newbury. John revealed much about the project, and what it was like to work for Howard. Apparently Howard had a habit of wearing sneakers, which allowed him to walk about very quietly. Howard would often stealthily enter a work area to monitor his staff without being detected. He was not always successful with this though. John recalled with humor that at times Howard would go a considerable time between washings of his sneakers - the odor of which would then betray his presence. We spent several hundred man-hours trying to locate the original blueprints. We had several leads and tips, and tracked the prints as far as Lakeland Florida. Unfortunately, we failed to locate them. This challenged the design team to "back engineer" the structures in the aircraft that are hidden from view. Considerable engineering time went into the reproduction. Old photos of the internal wing structure were pored over. Additionally, we were able to obtain the wind tunnel data done on the original aircraft (GALCIT report #135). The Hughes team spent over 90 days at the wind tunnel at the Guggenheim Aeronautical Laboratory, California Institute of Technology (GALCIT). Howard Hughes did not make guesses or leave things to chance. He was insistent that things got done right, regardless of the expense. The implementation phase overlapped the planning/design phase for the building of the replica. Major factors involved were the coordination of subcontractors, selecting talented and compatible team members, coordination with suppliers, and managing the hundreds of visitors. The coordination of subcontractors was sometimes challenging as time estimates were often exceeded. All tolled over 35,000 man-hours went into the replica. Some of the most talented artisans in the industry were employed on the project. "We've Never Pushed It This Hard"
Jim Wright's Hand  "We Did It" Selecting team members was straightforward. All were local pilots, all had experience with completing experimental aircraft projects (some award winning), and two are certified aircraft mechanics. 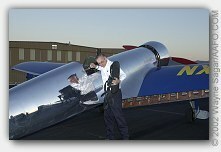 A total of five team members constituted the main team: Jim Wright, Ron Englund, Dave Payne, Mike Mann, and Al Sherman. Support to the team is provided by employees of Wright Machine Tool. Their efforts have not gone unnoticed. 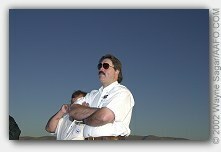 Local radio personality and pilot, Bill Barret, expressed his views in an open comment posted to the Racer Team on their forum. Bill was present at one of the initial flights and said, "... I tried to express to Jim (Wright), how much the H-1 project demonstrates the sometimes intangible American Spirit. I was in the Saturday throng that watched and listened with childlike excitement as Jim taxied out for take-off. When the H-1 surged off the runway and climbed powerfully into the blue, I was proud to see their dream realized. Although tucked away in a small hangar in Cottage Grove, Oregon this project speaks loud and clear to the spirit of America. Individuals grasping a challenge and seeing it become a gleaming reality. Jim and dedicated crew saw the goal, and did the hard work with obvious skill and patience. I was delighted to see the H-1 fly and to share its' story with my children ..."
It is difficult to capture (in words) the scope of an undertaking like this. I have been around a lot of experimental aircraft. Building an aircraft is not easy. It has been likened by some to climbing a mountain. In that sense the H-1B is the Mount Everest of experimental homebuilt aircraft. It has taken the talents of dozens of people to make it all come together. It has taken stubborn patience, hard work and an unprecedented attention to detail to reproduce this airplane. The list of talents employed to complete the project include: machinists, engineers, wood workers, metal workers, mechanics, assemblers, painters, electricians, secretaries and computer draftsmen. Above all else, it took the dream of one man who wanted to be the fastest man in the world, and the later dream of another who wanted to recreate that vision. Jim & Betty Wright At Reno, NV. Speed Run, Friday, Sept 13, 2002 I was once asked why anybody would want to tackle such a project. There really isn't a single canned answer to this. This aircraft is many different things to different people. It is tough to put into words. There is something timeless about the aircraft. It exudes an aura unlike any other aircraft that I have seen. A senior editor with Air & Space magazine once wrote us,"...it appears as a silver apparition, a ghostly incarnation of one of the most beautiful airplanes ever built." On September 13, 2002, Jim Wright flew the H-1 Replica to a new speed record (in category). The NAA man in charge of officials at the event noted later that his assistant had tears in her eyes as she watched Jim Wright sail over the timing gates. My suggestion to those that might ask "why?" is this: take a look for yourself at the Wright built Hughes H-1B. Get up close to the airplane and see what those guys built, both then and now. If you still have to ask why, you wouldn't understand the answer. NOTE: If you are interested in additional information on the Wright built Hughes H-1 Racer email the Racer Team at info@wrightools.com or visit the website at www.wrightools.com/hughes . About The Author: Dennis Parker works for Jim and Betty Wright at Wright Machine Tool Company in Cottage Grove Oregon. He was a key member of the team during the "reverse engineering" process in the building of the Hughes Racer Replica. Dennis is also a photographer and quite obviously, a writer. 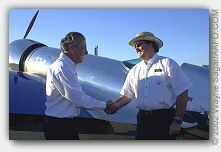 Dennis also designed and maintains the website for the Wright Machine Tool Company where you can find much information and photography of the building and flight testing process for this historic airplane. Note: These pages use Java Script and PHP embedding to open enlarged images. If you have Java disabled or use WebTV you may not be able to use this feature. copyright ©1997-2002 Airport Fence Productions, Inc.